The GVA WEM Commercial Management team at One Curzon Street win Safety Ribbon Award after scoring 90% in their annual audit. The team demonstrates continued commitment to achieving high levels of compliance – creating a safe and healthy work environment at One Curzon Street. 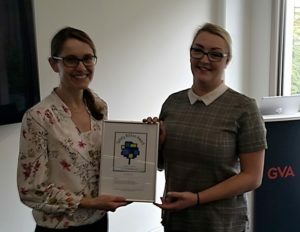 Claire Wood, of Hosking Associates, presents the award to Rachael O’Sullivan from the GVA WEM Team at One Curzon Street. What is the Safety Ribbon Award? ns prioritise health and safety management and take the first steps toward compliance. The Safety Ribbon award is first and foremost an audit tool to benchmark an organisation’s current compliance level against health & safety law, and to fulfil the annual review requirement of HSG65. To earn an award, Hosking Associates works closely with organisations, assessing them against a broad set of criteria in line with Health & Safety Executive (HSE)’s recommended ‘PLAN, DO, CHECK, ACT’ model, which ensures buy-in, support and direction from the management team. Each company is then given an audit report, action plan and overall score which serves as a benchmark for improvement. Companies who score 85% or above are awarded the Safety Ribbon Award and may use the award logo for a year to demonstrate to staff, clients, visitors, and the business community that a high standard of safety management is being practised every day. Those who do not achieve it are provided with recommendations for improvement and given the opportunity to be reassessed at a future date.